MESA OF LOST WOMEN (1952) Allan Nixon, Jackie Coogan. For pure schlock cinema value, this may be even better than Plan 9 From Outer Space. A group of peoples being held captive by a moron with a gun, crash land on a desert mesa where a mad scientist is experimenting with giant spiders and weird dames. Some of the most amateurish acting ever seen on film. 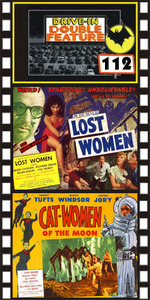 Plus: CAT WOMEN OF THE MOON (1953 aka ROCKET TO THE MOON) Sonny Tufts, Marie Windsor, Victor Jory. One of the granddaddies of ‘50s camp sci-fi. An Earth rocket expedition lands on the moon, only to find its members captured by a strange race of lunar females. Watch out for that giant spider! Pure, unadulterated schlock, now considered a cult classic. 16mm.